Charities & Fundraisers We Are Proud To Support! BAG IT is designed to assist anyone with any type of cancer. Click for photos from the 2013 Be There for BAG IT Chili Challenge event. Click for photos from the 2015 Be There for BAG IT Chili Challenge event. Click for a fun video from the 2015 Be There for BAG IT Chili Challenge event. The Colon Cancer Alliance (CCA) is a community that provides hope and support to patients and their families, while saving lives through prevention, research and patient support services. Our vision is for a world free of colon cancer, where education, early detection and treatment lead to survivorship for all. 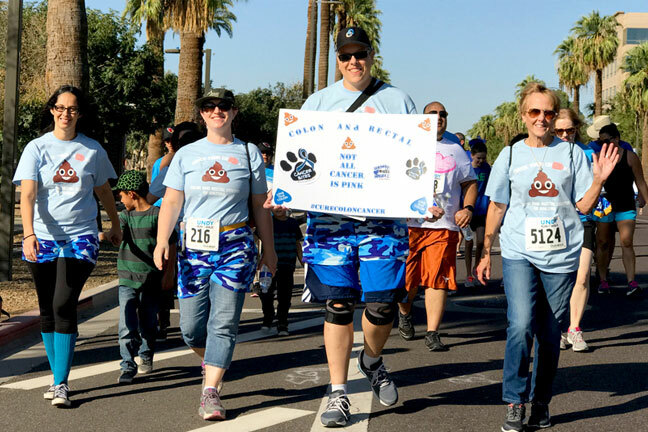 The Undy 5000 is a family-friendly 5K run/walk that was created by the Colon Cancer Alliance. 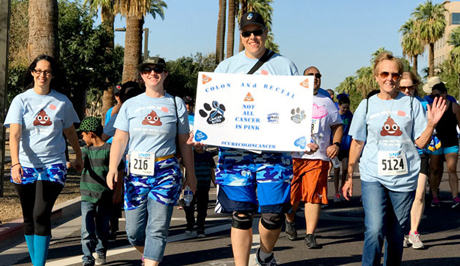 It is unique because participants are encouraged to run in their boxers to bring attention to the area affected by colon cancer. We have found that by getting people talking about this disease, we can save lives! Please join our team Check Your Cheeks, in fighting colorectal cancer this November for the UndyRunWalk on November 17th, 2018! The event starts at 9am and is located at the state capitol district (Washington St and N. 15th Ave, Phoenix). Thank you for helping to support this cause and we hope to see you on the 17th! 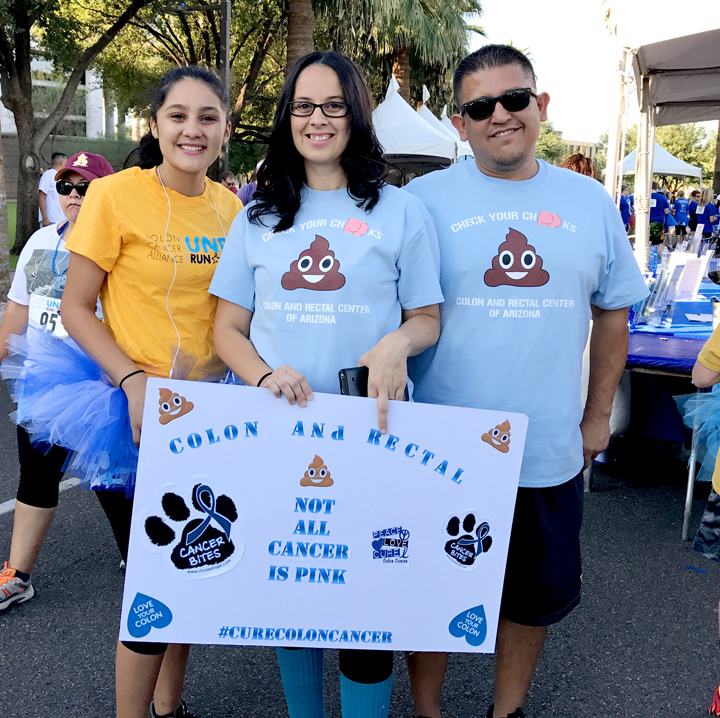 The Colon and Rectal team participating in the 2016 Undy 5000 on a beautiful day in Phoenix! Sonya and her family showing their team spirit at the 2016 Undy 5000! The LoveIAm mission is to reach out into our world displaying love, kindness, and compassion for one another. The LoveIAM charity was created in memory of Liam Ross Murray, who was born on Thursday, January 8th, 2009 with congenital heart defects. Little Liam's parents Ross and Daradee Murray got to spend 26 wonderful days with their beautiful son before he passed on Monday, February 2nd, 2009. Out of the inspiration of strength, courage and love that Liam gave the world, LoveIAM was born. Click for a fun video of the 2016 LoveIAM charity event. Dr. Harding posing with a poster from the LoveIAM Charity which we were very proud to receive and be a part of! This year LoveIAM's event raised $75,000 to send kids with congenital heart conditions to their own camp! Dr. Forstner and her husband Mike enjoying the awesome 2016 LoveIAM event! Porellos "Help us to help others"
Dr. Forstner takes great pride in being a co-founder of Por Ellos along with her two dear friends, Suyen Largaespada and Tobias Engert. Headquartered in Phoenix, Arizona, USA, Por Ellos coordinates projects primarily for the locale of Granada, Nicaragua, a large colonial town in Southern Nicaragua, expanding to the rural areas surrounding the urban zone of Granada. Por Ellos develops projects to bridge the gaps in other existing larger projects, supplying resources and professional expertise to improve the conditions of the local population. Por Ellos addresses the entire community, using small, concrete projects focused on the areas of health, education, and nutrition with the ultimate objective to improve the quality of life and there bye to improve the social situation. Por Ellos has helped to renovate preschools and trade schools in and around Granada in addition to running basic health education days in the rural areas. Currently we have a long-running project of a physical therapy and counseling center for 80 disabled children and their families and are in the process of expanding our weekly English school to a second location. Like us on facebook or check out the web site for the latest events and option to donate!